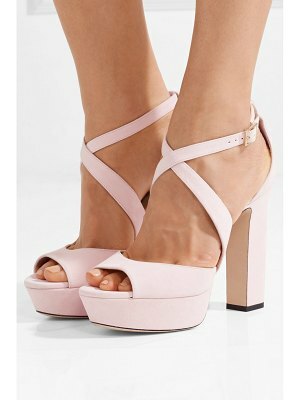 Block heel and platform elevate suede ankle-strap sandal. Self-covered block heel with tilt-effect plate, 5" (125mm).Self-covered platform, 1.5" (40mm).Compares to a 3.5" heel (90mm).Suede upper. Open toe. Concealed ankle-strap closure. Leather lining and sole. Imported.